The Ngozi Family were from Zambia. The Republic of Zambia, which had previously been called Northern Rhodesia, was founded in 1964. The country had seceded from part of the British controlled Federation of Rhodesia and Nyasaland, which had joined Northern and Southern Rhodesia (now Zimbabwe) with Nyasaland (now Malawi). The band started in 1975, and was lead by Paul Dobson Nyirongo (a.k.a. Paul Ngozi) who was know for his spectacular stage antics, that included playing the guitar with his teeth. They were the first band to have been called ‘Zamrock’. Paul Ngozi was adored by Zambian music lovers. His music is also best remembered for his poignant lyrics that reflected the life and times of Zambians. He won many awards and represented Zambian music in both Europe and the United States, and even went on a controversial tour of South Africa at the height of the Apartheid Era. 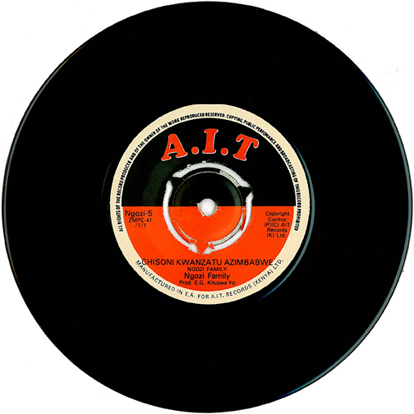 Catalog number Ngozi-5 ZMPC-41 on A.I.T. Records of Kenya. No release date given.